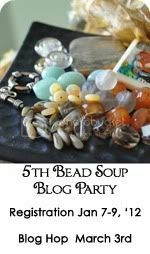 It seems like every blog (almost) that I look at these days has some info about the Bead Soup Blog Party (which I keep calling the Blog Soup Bead Party!). My partner is Kelly at Adventures with Kelly and what a breath of fresh air she is! She couldn't be more opposite me -- she's young, she's a gardener, she cooks, she backpacks and hikes (OMG! ), she's a newlywed (a year still counts, right?). And I love reading about her active life, and her cooking, and pets. I'm very grateful to Lori for introducing us. That said, I had a horrible time picking out beads! I wanted to send things she'd enjoy and that kind of went along with her lifestyle. But I was having so much trouble picking out the right things that I actually thought several times that I shouldn't have joined this party. Now, you all know that one of the reasons I started this blog was so I could participate in this party. But this angst I'm having is not so fun. The package is mailed. The deed is done. I hope I didn't get it totally wrong. No photos (I was so distressed I forgot to take any). I hope you're all having fun with this and not getting so stressed out by it! I suspect you are being too hard on yourself. I was so nervous the first one, too.You did fine, I bet! Soooo.. how much will it freak you out if I say I'm only following you because of the Bead Soup Blog Party! Honestly you are being too hard on yourself. I also had a hard time picking out things to send to my partner. She makes lampwork beads, I make ceramic beads but that's just dirt that's baked...she works with GLASS! I'm sure you sent wonderful things! Have FUN with what you get. That's all that matters!! Step 1 is done - bead soup out the door! Now don't think another thing about it, I'm sure they are wonderful! Now just sit back and wait for the excitement of getting your soup in the mail! That's the best part!!! I've had the same feelings. I almost backed out when it came time to sign up. But I sooo wanted to try this. I'm sure your partner will love what you sent. Hoping mine does. Bet we'll all have tons of fun. Don't be distressed! This is for fun, and to challenge your partner -- and it's up to THEM to do with what you send. I handle meanies, ok? And your partner is NOT A MEANIE!